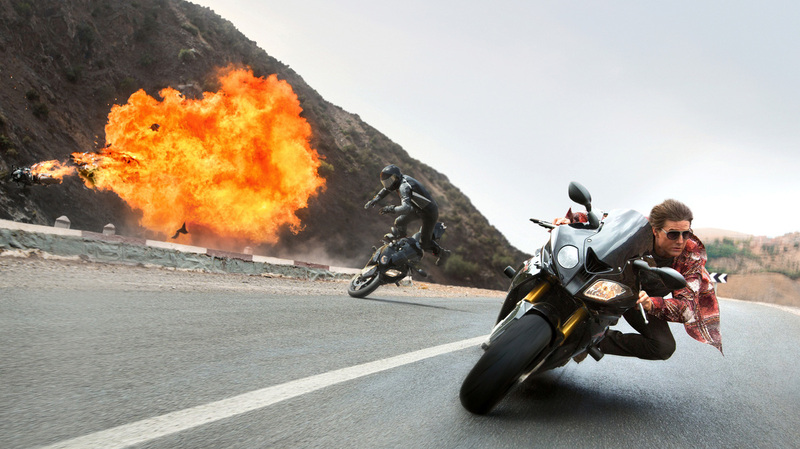 Review: 'Mission: Impossible - Rogue Nation' Tom Cruise returns as secret agent Ethan Hunt in the latest Mission: Impossible -- a super-fun sequel executed with rigor, clarity, and creative use of Puccini's Turandot. In this masterful set piece, various constituencies of spy and counterspy angle to assassinate or protect the Chancellor of Austria, who's watching Puccini's Turandot from a balcony box — oblivious, like the rest of the audience, to the sweaty melee playing out literally in the wings. Ethan Hunt, the colorless, odorless, highly acrobatic secret agent embodied by Tom Cruise, fights a side of Slavic beef 150 percent his own size. Elsewhere, a new-to-the-series spy of murky loyalties, played by the ravishing Swedish actress Rebecca Ferguson, waits for a specified note in the score to fire her rifle. Onstage, a Chinese prince tries to solve three riddles to win the hand of Princess Turandot. The price of a wrong answer in Puccini's opera is his life. Clipped out of the almost-as-good 131-minute feature surrounding it, this sequence would work beautifully as a short film. It's a sterling example of the elegance, wit and harrowing flesh-and-blood stunt work that have made the "Missions: Impossible" the most reliable blockbuster series going: Five films, some weirder than others, but not a stinker in the bunch. The only thing that (slightly) disappoints about the otherwise copacetic new Rogue Nation is that unlike every prior Mission, it's not a big stylistic departure from its predecessor, 2011's Brad Bird-directed, best-seen-in-IMAX Ghost Protocol. Every entry has come from a different auteur director, and Cruise-the-producer has allowed each one to leave their stamp on the malleable franchise. This time, it's Christopher McQuarrie, a veteran screenwriter and relatively green director who previously teamed with Cruise on Jack Reacher and Edge of Tomorrow. Like those two overlooked gems, Rogue Nation is exciting, stylish and funny. It's also 10 minutes too long, an overage I suspect McQuarrie would've corrected had the film's original release date not been moved up by five months. There are a few factors contributing to the déjà vu: 1) Rogue Nation's retains more of the previous film's players than is customary. Hunt allies Simon Pegg and Jeremy Renner both get major screen time, and Ving Rhames, the only actor besides Cruise to show up in every movie, has an expanded role. 2) Robert Elswit, the Oscar-winning cinematographer who provided Ghost Protocol's desert gloss, is back, giving this follow-up a similarly airy look. 3) Cruise has the same haircut for two consecutive movies. 4) The plot involves Hunt going, you know, rogue and being, um, hunted by his own government — for the fourth time in five films! But what Rogue Nation lacks in novelty, it more than makes up for with verve. A spry 52 when the film was shot, Cruise — still his own stuntman — clings to the fuselage of an Airbus A400 cargo plane flying thousands of feet off the ground, swims underwater for several minutes without a breath, careens a motorcycle, sans helmet, around a winding Moroccan highway at suicide-miles-per-hour, and uses his oft-demonstrated if little-remarked spider-strength to shimmy up a pole to which he's handcuffed, using only his hips and his abs. Are you not entertained? Woven in among the capers is an espionage story that recalls the first film, the Brian De Palma-directed Mission: Impossible of a generation ago by being more opaque than is strictly necessary. I'm sure I'll sort it out on a second or third viewing. All that matters is that Ferguson's Ilsa Faust (great name, that) is a marvelous addition; a smooth, alluring operator who is Hunt's equal in every way. Her signature move when clobbering taller, male opponents is to leap onto their shoulders and wrestle them to the ground with her legs. It never gets old. And unlike the heroine of the year's biggest hit, Jurassic World, she's sensible enough to take off her heels before rappelling down the side of a building. There's only a flicker of attraction between her and Hunt. There's some other inspired casting. Sean Harris, who plays the leader of a ring of presumed-dead covert agents now using their skills to sow strategic unrest, looks like a lab-grown hybrid of good guys Cruise and Pegg. And Alec Baldwin brings his welcome comic pomposity as a C.I.A. official who convinces a Senate panel to shutter and defund the Impossible Mission Force, making Hunt a fugitive. Trying to sum up the danger of allowing Hunt to roam free, Baldwin is reduced to poetic abstraction. He reels off all the usual superspy credentials before concluding, "Hunt is the living manifestation of destiny." It's an absurd line, and the movie could've used a few more of those. (McQuarrie gave Cruise better jokes in Jack Reacher). But you won't remember it. Because even without the Turandot sequence Rogue Nation still has at least three other stand-up-and-cheer set pieces, executed with a rigor and clarity the crude Fast & Furious series can't touch. Everyone knows action speaks louder than words.